Name-drop a fella enough, and you start to feel guilty about it. Or in other words, the time has come, the Walrus said, to review a classic Dario Argento film already. Our volunteer is Deep Red, 1975 giallo that was one of the director's finest works in genre that made his name. It comes in two different flavors: a 126-minute cut that premiered in Italy and most of Europe, and a 98-minute cut re-edited for the American (and, I believe, British) markets under the title The Hatchet Murders. There are those who would have you believe that the shorter version is the better of the two, being tighter and more focused. I am perfectly happy for those people, but for the rest of us, Argento's original cut is much superior, clearing up a couple of gaping plot holes left by the American edits, substantially increasing our understanding of the main characters, and lightening a fairly grim story with some low-key comic relief. No, it's not as focused, but anyone going into an Argento film looking for focus is going to end up disappointed no matter what. But forgive me - I haven't even introduced the man yet, and in a review where that was the whole point! Once upon a time, there was a magical place called the Italian film industry, which presented art filmmakers like Federico Fellini and Michelangelo Antonioni as its ambassadors to the world, while keeping fiscally afloat on the backs of just about the most shamelessly derivative genre films ever made. The best of the Italian genre directors - men like Sergio Leone in the Western, or Mario Bava in horror - attained an artistic reputation all their own, although the great majority of these films were made anonymously and cheaply, and at a breakneck pace that would shame the Hollywood system of the silent era. In this environment, Dario Argento got his start writing Westerns in 1967. Having even a modicum of talent meant that you got promoted quickly, and thus in 1970, at 29 years old, Argento wrote and directed a murder mystery called The Bird with the Crystal Plumage. This film was an entry in the supremely popular genre called giallo, after the yellow-backed pulp novels that inspired it; these were hyper-violent, sometimes highly-sexualised whodunnits on the Agatha Christie model, almost always involving mysterious figures wearing trench coats and black gloves whose identity we learn only moments from the film's end; usually, it would be someone we'd already seen, and occasionally, the reveal actually made sense. Ultimately, the gialli would inspire the rise of the American slasher film, which were then copied in Italy, though by the time the Italian slasher films started to crop up, the giallo was all but dormant, in favor of zombie and cannibal movies. I do not know how successful The Bird with the Crystal Plumage was at the box office, but it was an aesthetic triumph - for those who would admit that a giallo could have any aesthetic whatever - signalling to anyone with eyes to see that for the first time, Bava wasn't the only horror director who also knew how to make a great film. Argento followed this with two more "animal" gialli, a couple of episodes for a TV mystery anthology, and a satiric comedy; and this brings us at last back to 1975 and Deep Red, Argento's finest film up to that point, and the last true giallo he made prior to Suspiria, a supernatural thriller that remains the director's best, and best-known film. The film is a perfect example of the generic form: Marcus Daly (David Hemmings), a British pianist teaching at a Roman conservatory, has just helped his very drunk friend Carlo (Gabriele Lavia) out of a bar when he hears a scream coming from his building, looking up just in time to see his upstairs neighbor, Helga Ullmann (Macha Méril) getting murdered by a figure with a hatchet; we already know that Helga is psychic, and had discovered the murderer's identity by accident. (Incidentally, that's a great example of how the two cuts of the film differ in small, hugely important ways: after the disorienting, violent credits sequence, the first scene the Americans got to see was Helga giving a lecture; the Italians first saw a brief snippet of Marcus teaching his students. Making the identy of our protagonist much less of a guessing game for them). By the time Marcus gets to her apartment, the killer has escaped, although he notices someone in a trench coat leaving the building when he runs to the window. Over the next few days, Marcus tracks down one clue after another with the help of news reporter Gianna Brezzi (Daria Nicolodi), probably sleeping with her in the process; and with police superintendent Calcabrini (Eros Pagni) - unlike slashers, gialli are populated by cops, and they're often very competent. Along the way to finding out who really did it, Marcus stumbles across one peculiarity after another: a chipper, unendingly creepy children's song; a haunted house on the outskirts of Rome; an addle-minded old lady who confuses "pianist" with "engineer"; and the drunken ramblings of Carlo, who may or may not have seen the killer. A perfect example, I called it, and that's just what it is: hardly any plot to speak of, just one scene after another of a character realising something and either a) not figuring out how it ties into everything else, or b) dying violently. Eventually, everything wraps up fairly neatly, and in this respect, Deep Red is actually exceptional: it's hardly typical that at the end of a giallo we're at all certain of what happened, and ususally the killer's motives are just a matter of fiat: he killed, so he must be a killer. Deep Red actually makes something like sense, although by American or British standards, there's a lot left hanging (for starters, this film is part of the proud Italian tradition of ending the film immediately after the killer is stopped - we barely even see Marcus's reaction for more than a few seconds). It's for this reason that I'd consider nominating this as the best introduction to Argento's work: it's neither his most engaging (Suspiria) nor his prettiest (Opera, unless that's also Suspiria) film, but it's possibly his most coherent. The thing about Argento, though - the thing about all gialli, from the best to the worst - is that you're not really there for the plot. You're there for the visions, first and above all. It's the creation of absolutely mesmerising imagery that defines the genre more than anything else, more than black gloves or incoherent plots (the fixation on creating fantastic imagery is sometimes cited as the very reason that gialli tend to be so confusing - the filmmakers didn't actually care about telling a story), and in this respect, Deep Red delivers in spades. Like any good giallo, its most memorably, unsettling images involve death: the image of Helga with glass shards in her neck; the image of a bird impaling itself on a knitting needle; the image of a lizard writing in agony with a hatpin through its body (by the way, animal lovers? 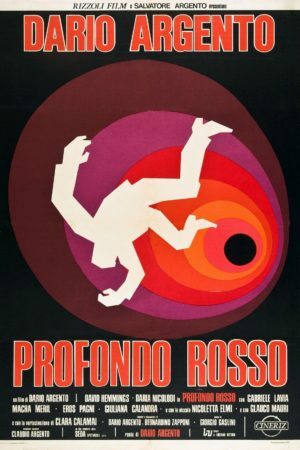 Stay away from '70s Italian horror); the image of the killer being killed slowly, inexorably, and accidentally killed. Insofar as the great Italian horror films are also great cinema - and I'm not comfortable with any definition of "great cinema" that doesn't include Deep Red - it is because of the powerful content of the images themselves, rather than the formalist niceities of how they were put together (I should not, though, shortchange the incredible soundtrack: the construction of audio being a much different creature in Italy before the mid-80s, when there was no sync-sound. This leads to obviously artificial soundscapes full of harsh sound effects that add to the uneasy feeling that the hyper-stylised visuals have begun to create; add in the marvelous jazzy score, with as few jarring techno notes by Argento's band Goblin, and you have one of the most distinct-sounding horror films of the decade). We who love the gialli tend to love them for their iconic nature: I don't know what the hell a dying lizard has to do with the plot of Deep Red or anything else, but I know what it makes me feel to see it, and I know I'll take that shot to my grave. That's the most that any movie can ultimately hope to do: move the viewer so deeply that he or she is fundamentally altered. In his heyday, Argento had the knack for doing that with some regularity, and he rarely ever did it better than here.